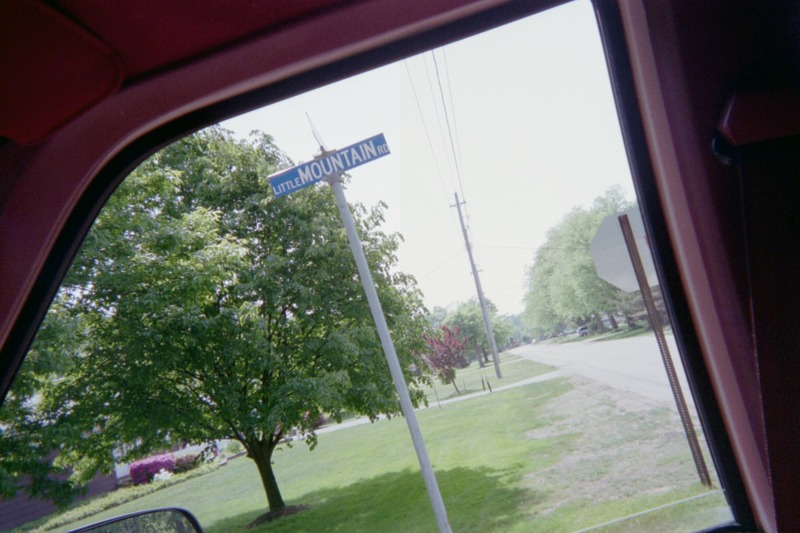 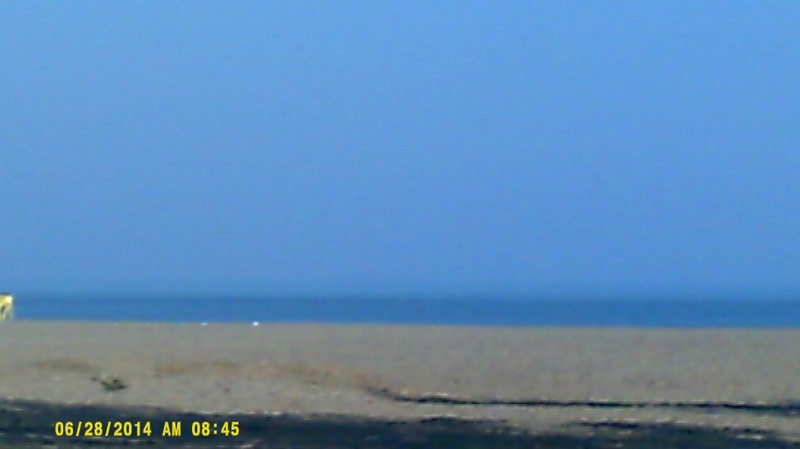 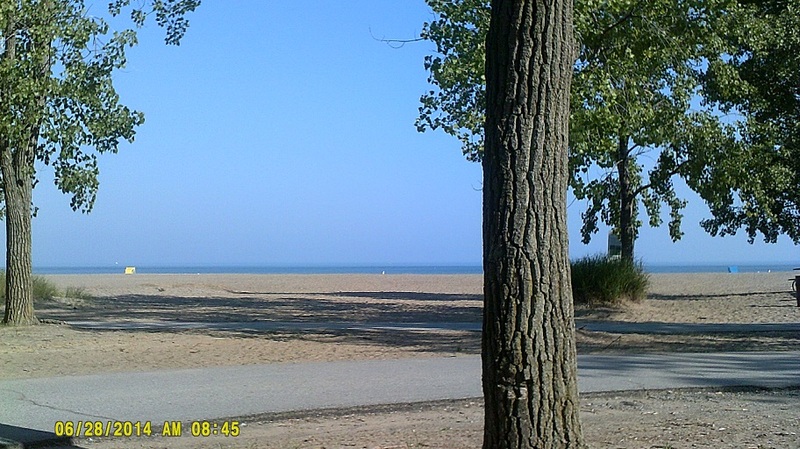 Update August 3, 2014: I have put every photo of Mentor on Roadfan.com taken since about 2004 at the bottom of the page. 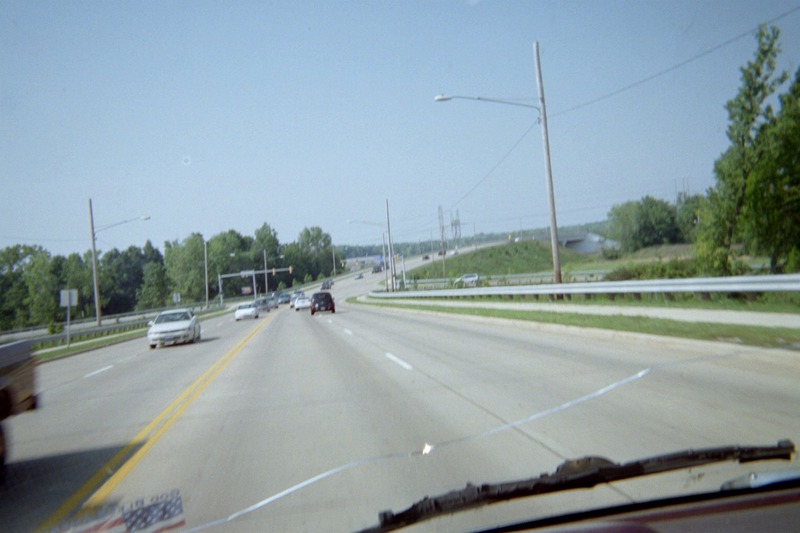 The Plaza Boulevard extension over the railroad tracks north of Great Lakes Mall opened just after 12pm on May 17, 2018 (details). 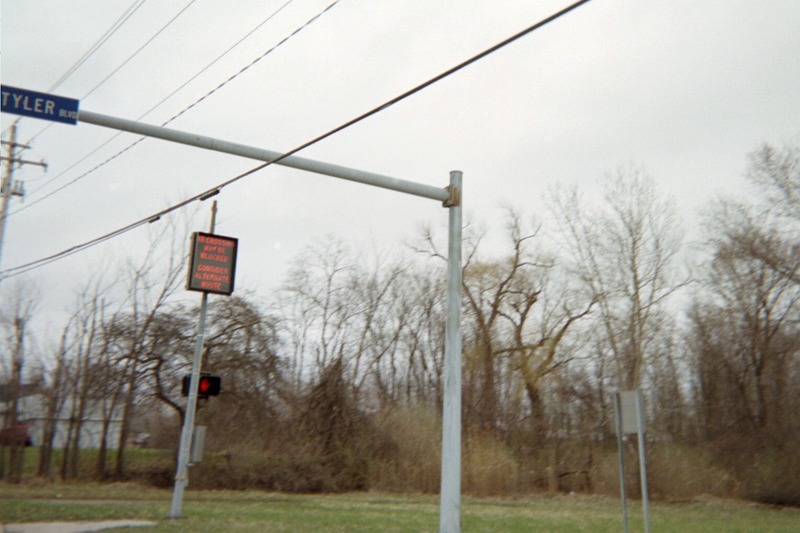 Along Ohio 615 Northbound you will find this sign, which is designed in the style usually only found in New Jersey. 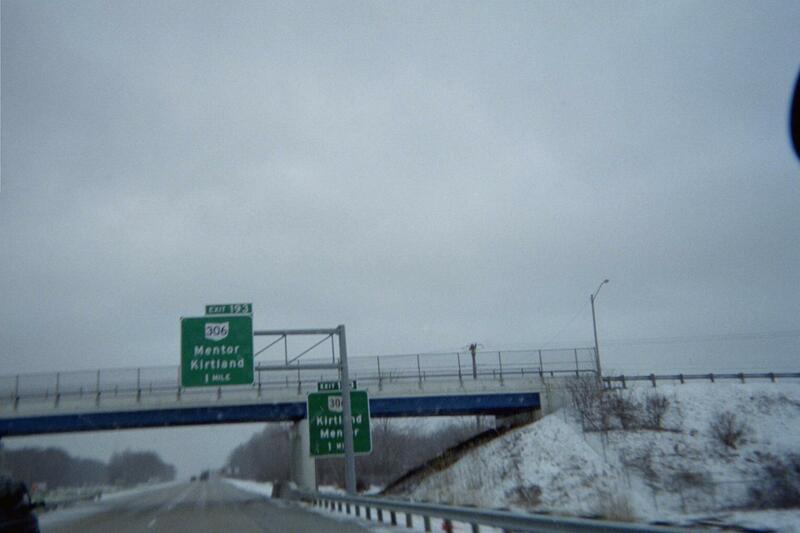 At the left end of this sign bridge is the first of two successive variable lane-use signs, the second of which is pictured below. 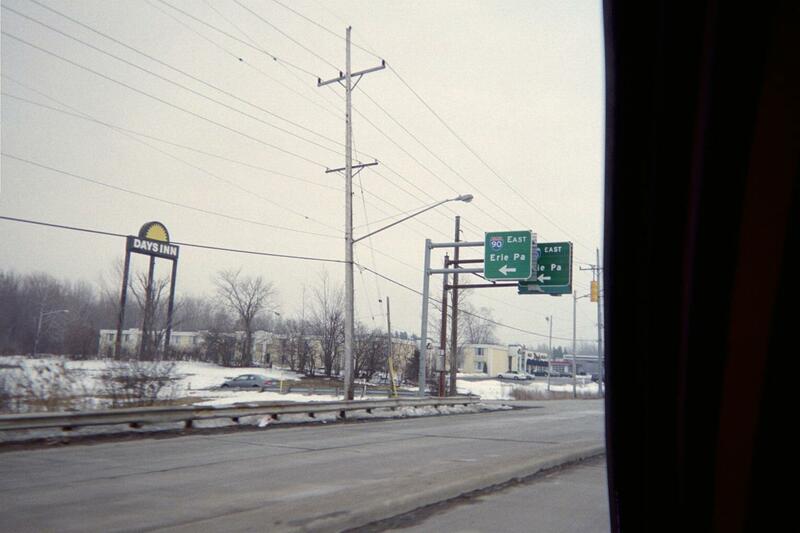 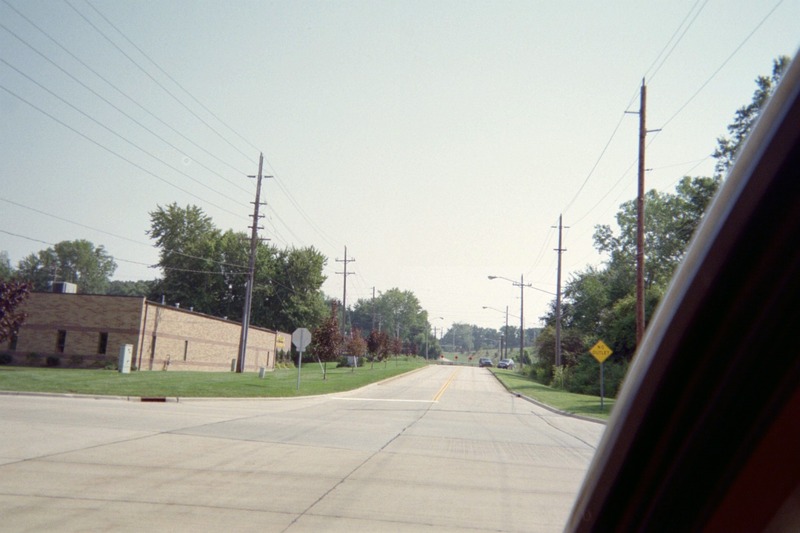 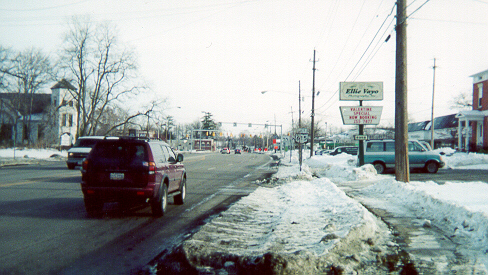 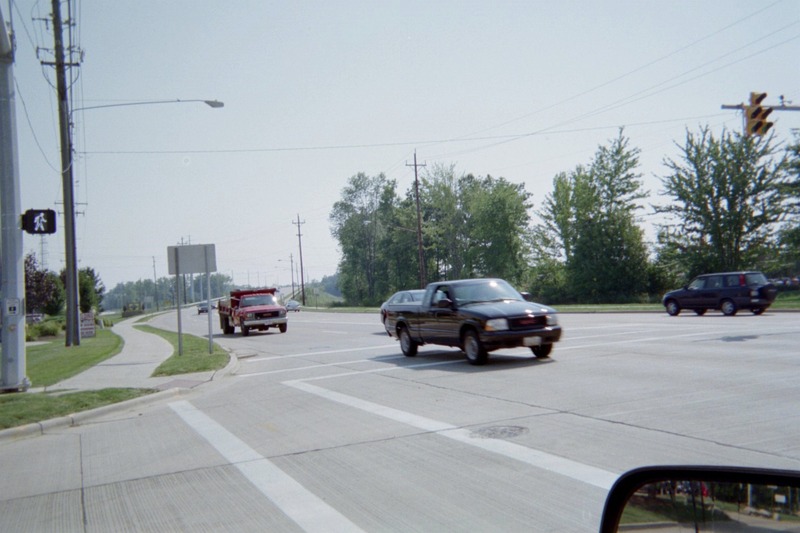 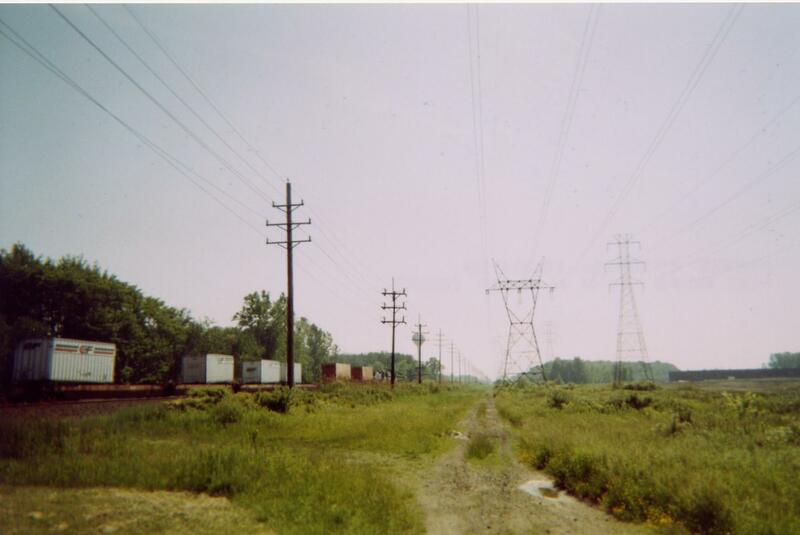 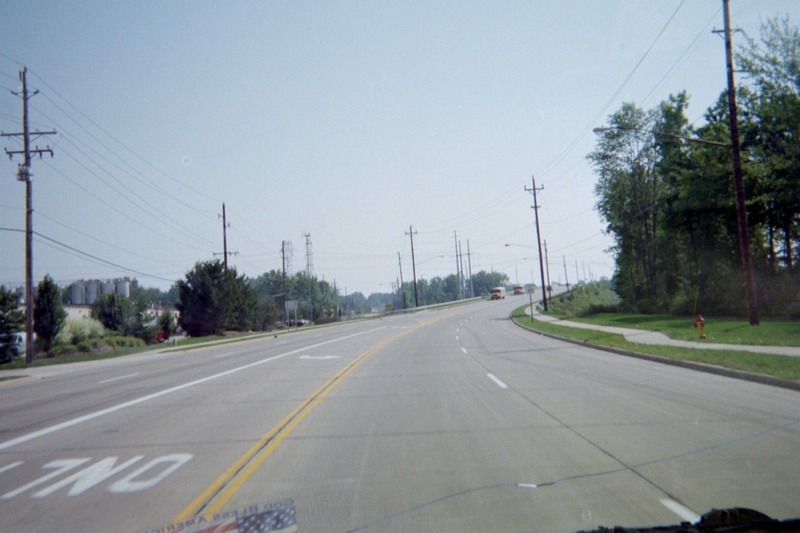 Sometime between 1996 and 1998, the right lane of Ohio 615 approaching Tyler Boulevard from the north in Mentor just south of Ohio 2 was designated as right-turn-only during restricted hours, and thru-right the rest of the time, undoubtedly due to large trucks wanting to turn right on Tyler to reach a major industrial area. 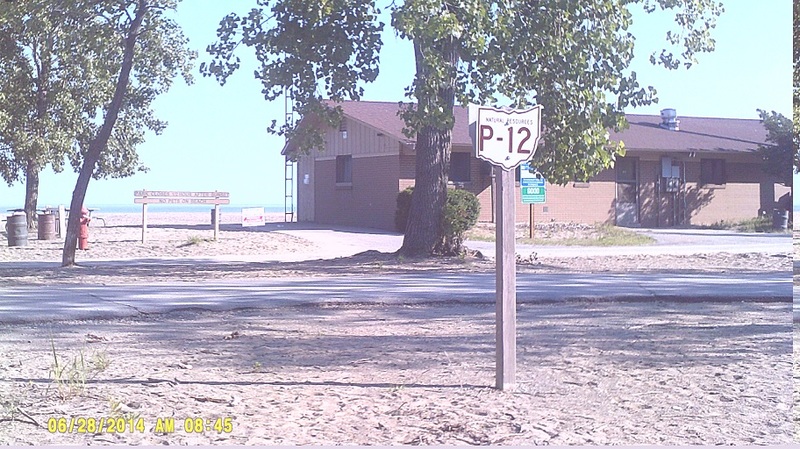 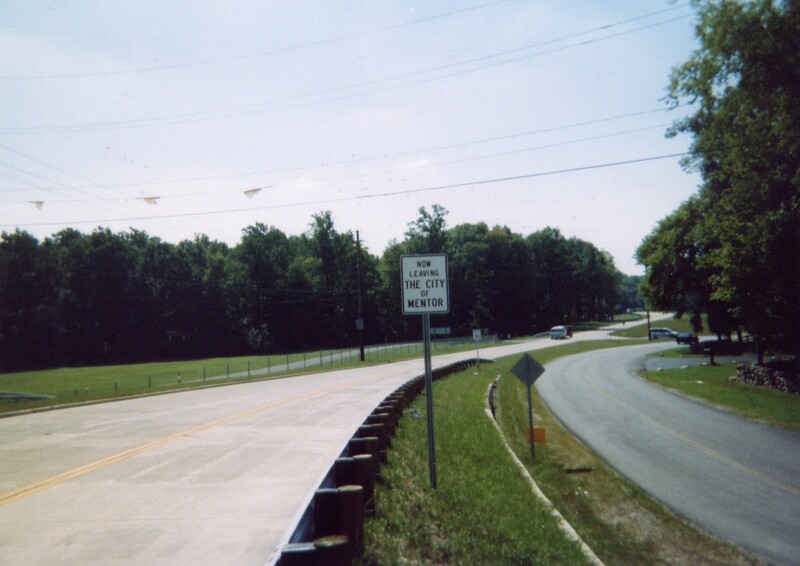 The lane conditions are identified by the overhead variable signs like this as well as a "RIGHT LANE MUST TURN RIGHT" sign supplemented with a plaque listing the restricted hours, 6:30-9:00 am Monday-Friday as of late June 2001 (partially pictured). 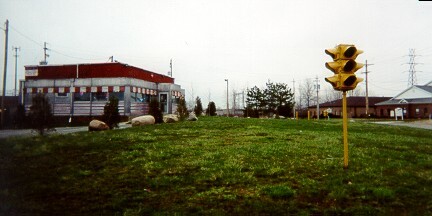 Annabelle's Diner - The near signal features unusual colors now (that it's not in use by any DOTs), such as blue. 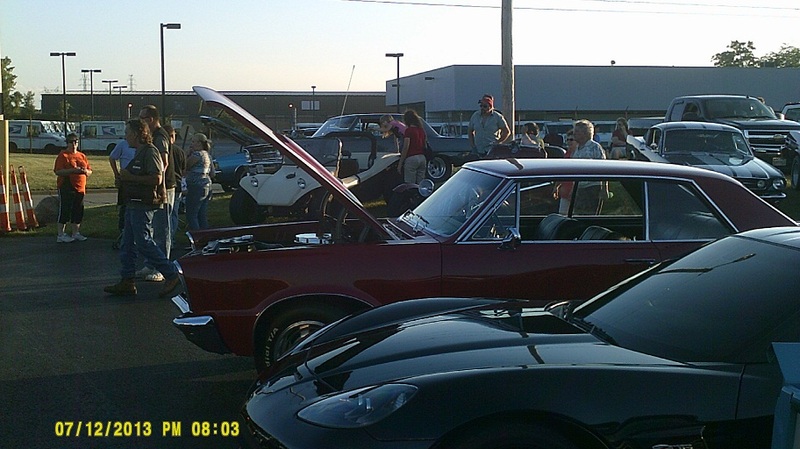 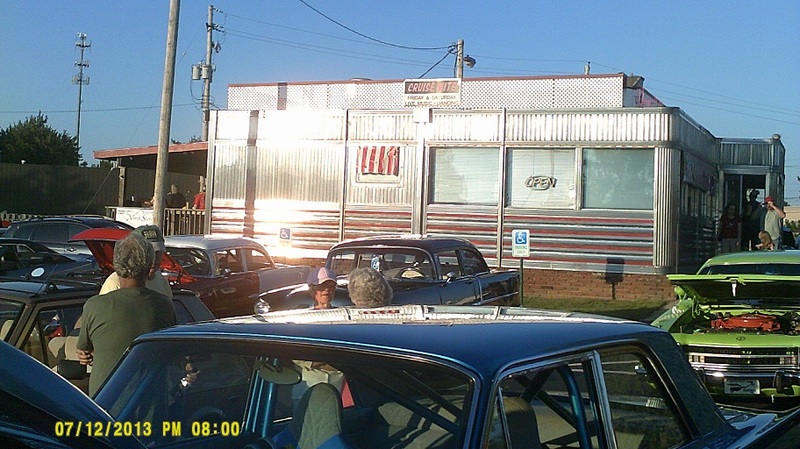 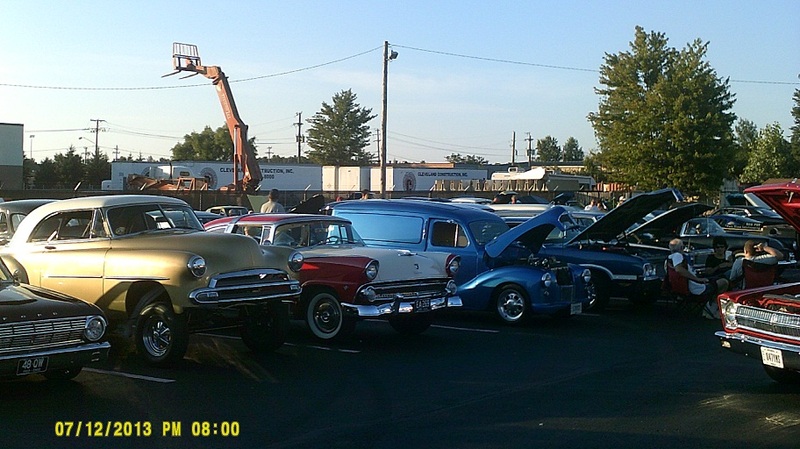 Annabelle's is the site of many classic car shows. 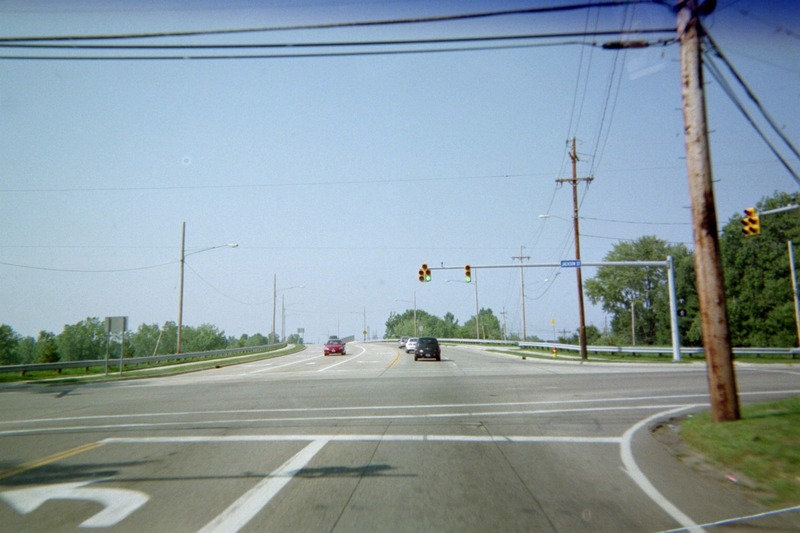 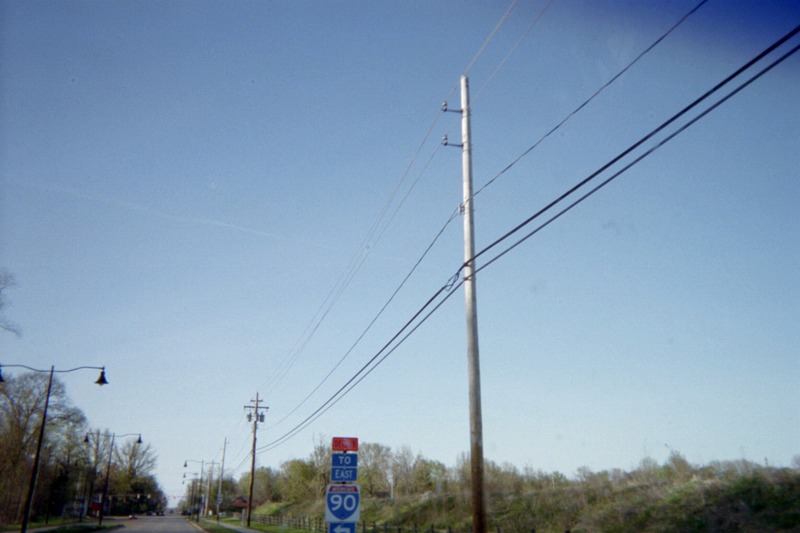 By May 28, 2004, the right lane of SR 615 southbound approaching the intersection (coming from the left in the photos) had had its right lane changed from right only to through-and-right, and the right turn doghouse replaced by a conventional red-yellow-green signal, undoubtedly due to the opening of I-90 interchange further south. 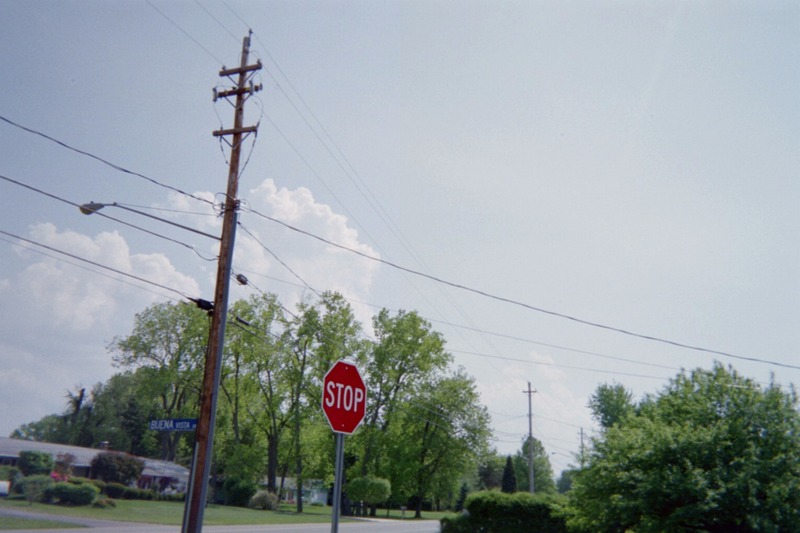 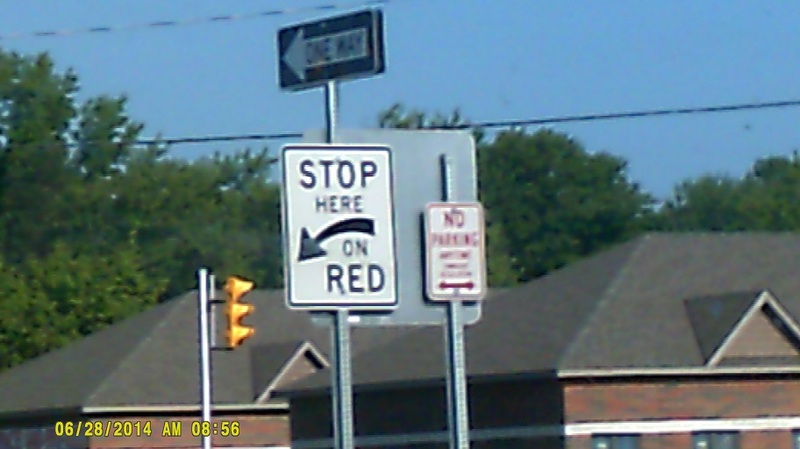 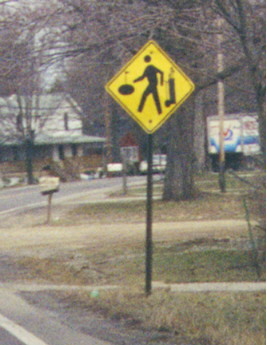 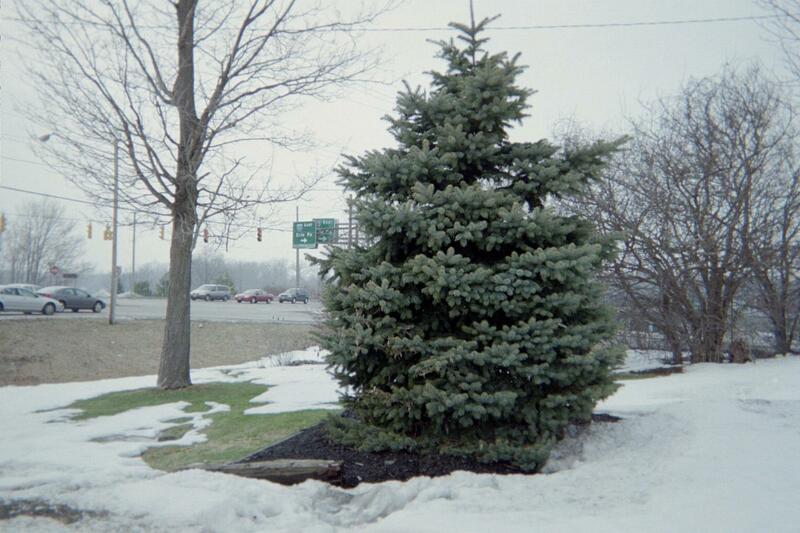 "KEEP RIGHT" in place of an arrow was a common set-up in Ohio (but we have wised up). 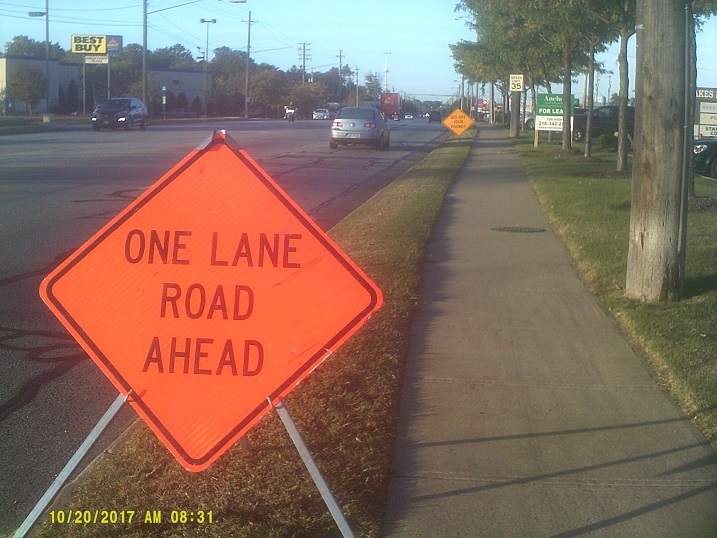 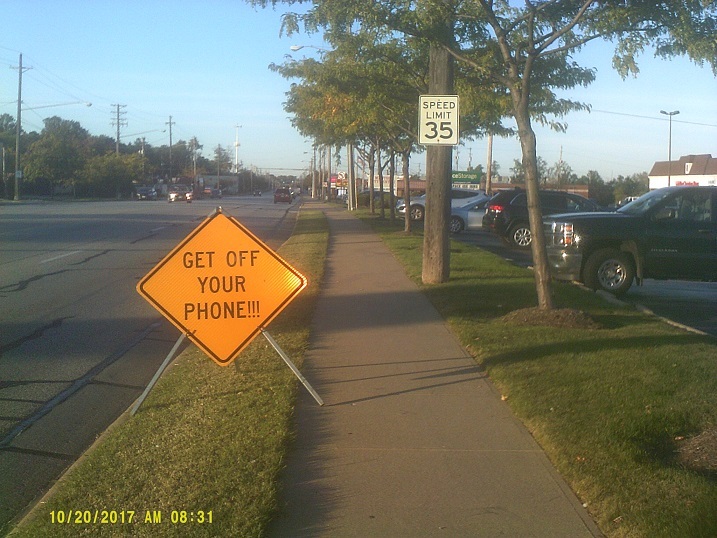 [Note, 1/11/18, MGF: For what it's worth, the sign is still in ODOT's Sign Designs and Markings Manual, sign M5-H6a in Chapter 4d.] 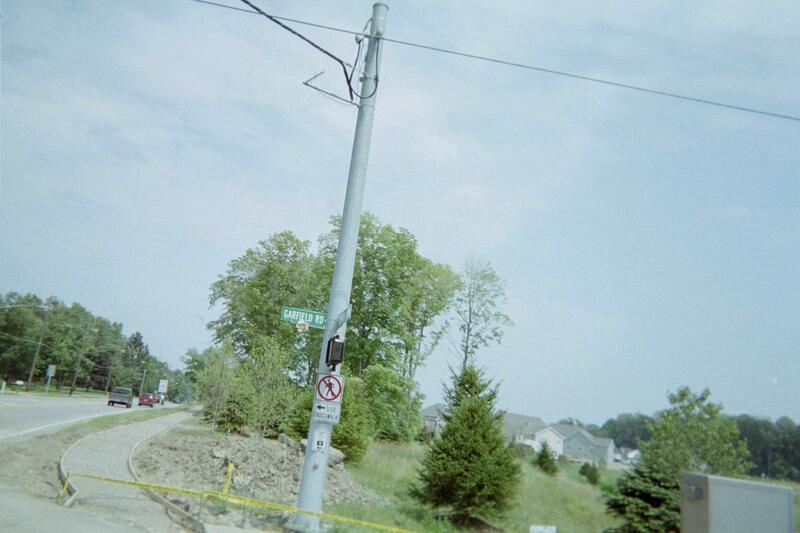 You can see evidence of a widening project on the right side of this photo. 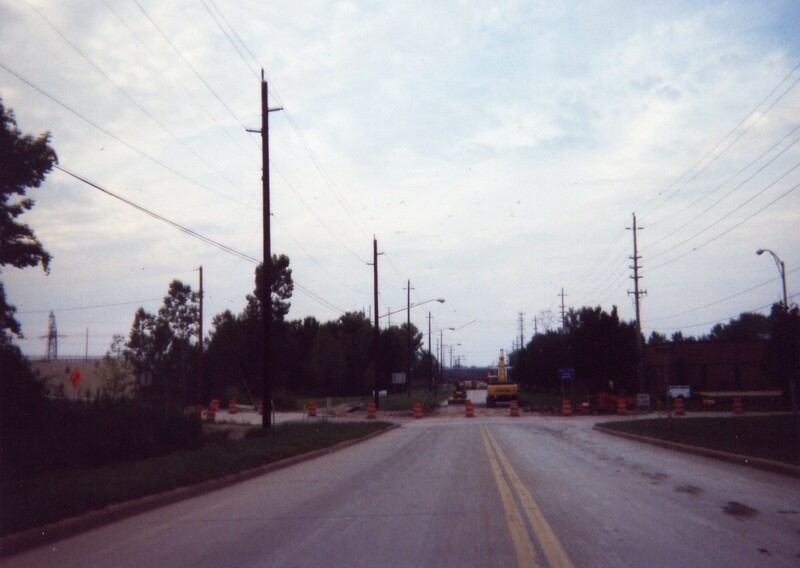 Update: By November 16, 2002, considerably after the widening project had been finished, this assembly was replaced by a [JCT] assembly, even though there was a pre-existing [JCT][left-and-right arrow] just in front of it <shrug>. 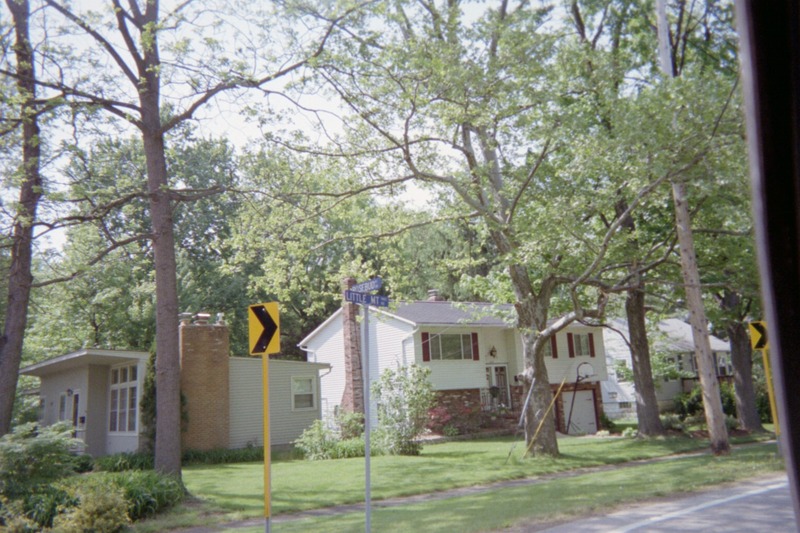 The "after" photo. 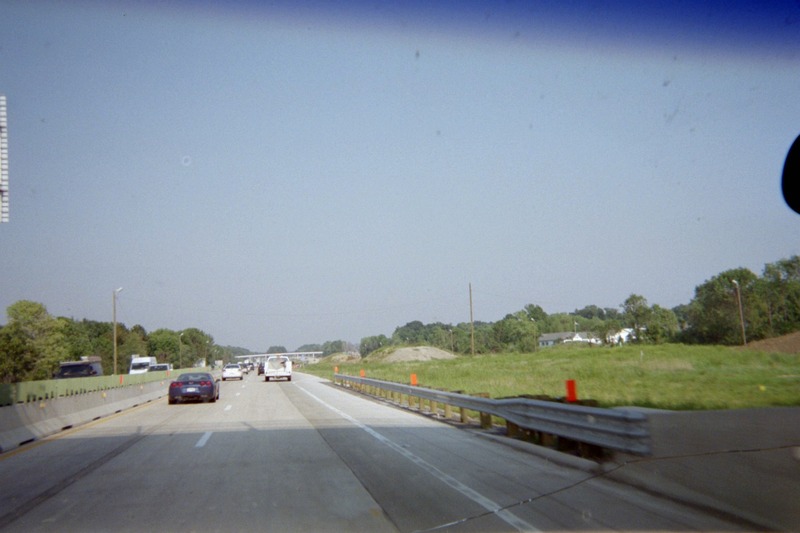 This section of road was widened as part of the project cited in the above entry. 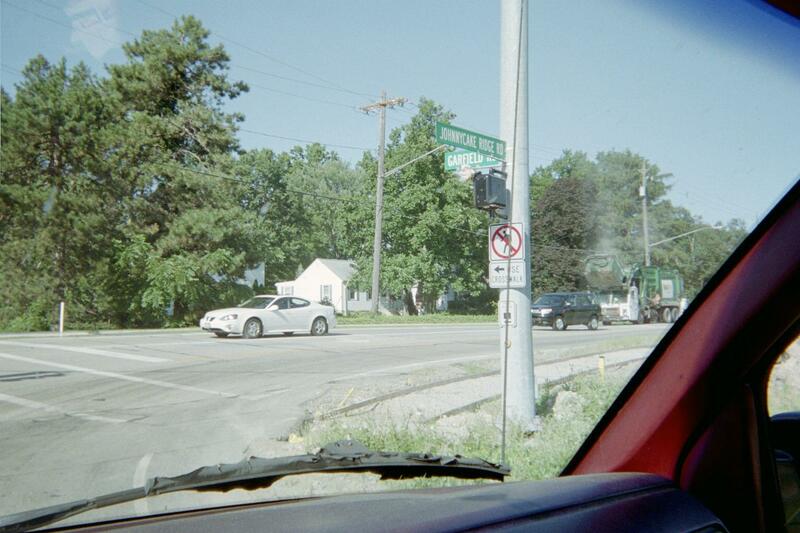 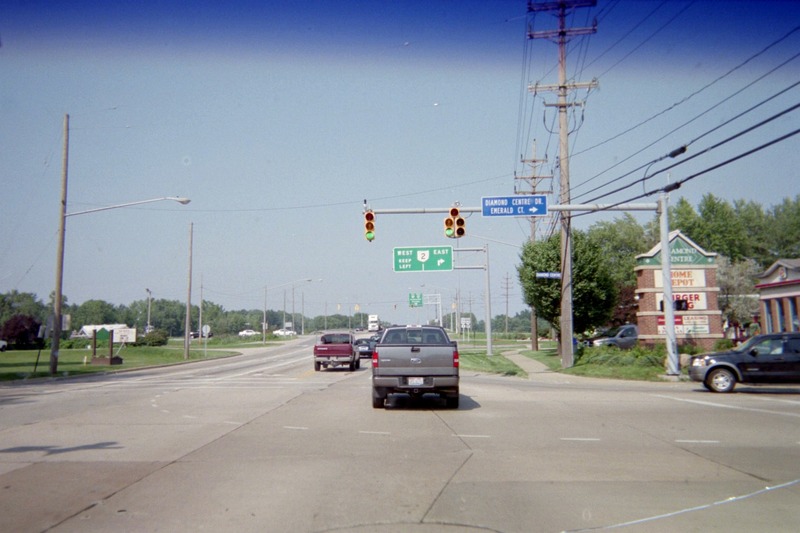 The five-lens right-turn signal is rare anymore in Ohio (and there is a duplicate just off to the right). 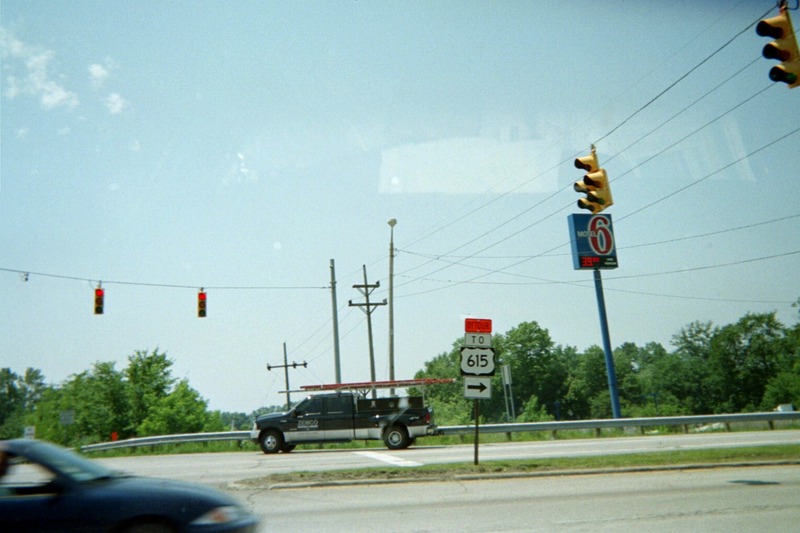 These lights replaced four-lens lights which lacked a yellow arrow (the yellow solid lit up, with the red, instead). 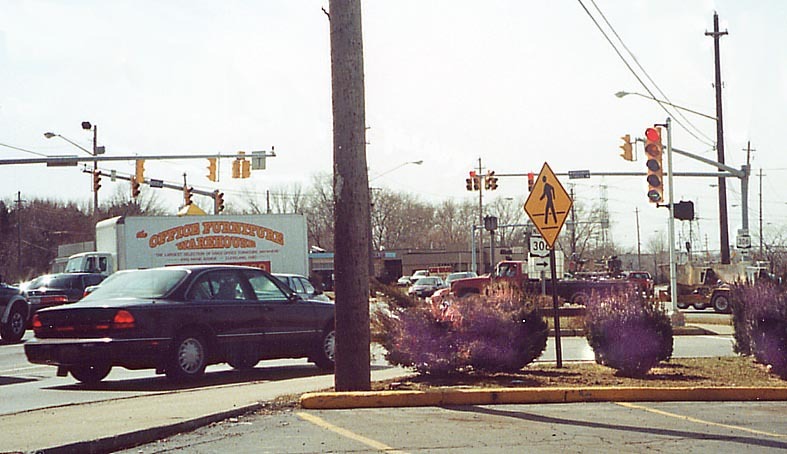 Update: By February 25, 2002, all the arrows, the red solids, and all but one green solid (rightmost through on 306 NB) were converted to LEDs, with new LED pedestrian signals installed by April 16, 2002. 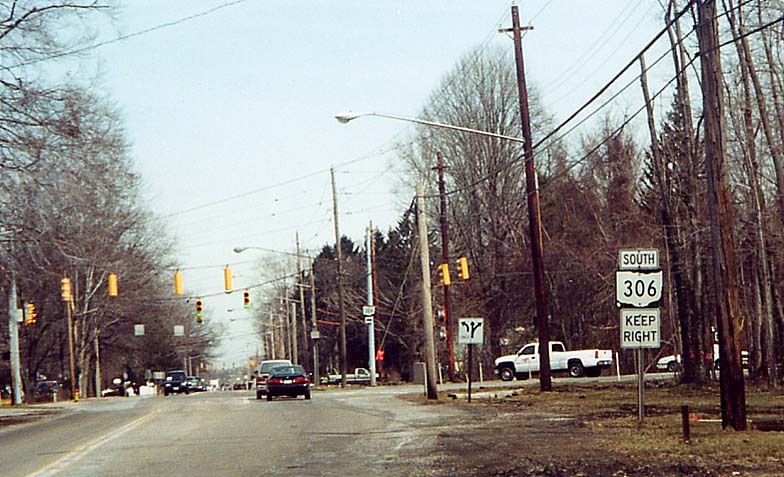 In early April 2002 a dip had formed on US 20 EB heading away from 306 (the intersection is just behind in the first picture) and it was signed with temporary signs. 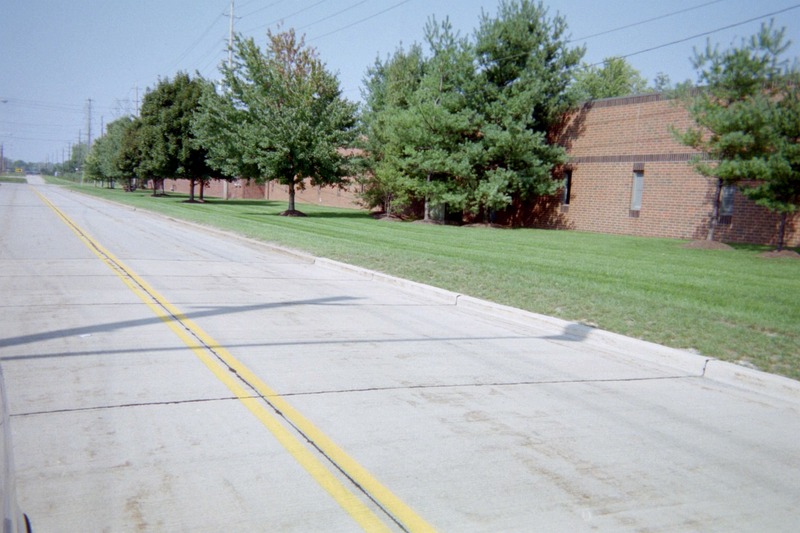 They didn't last long as the dip was fixed with a new layer of asphalt by the following May 8. 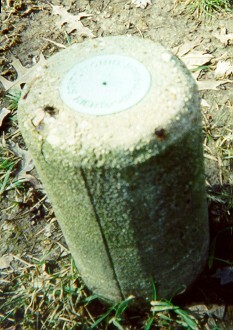 State of Ohio Right-of-Way marker along Ohio 84.